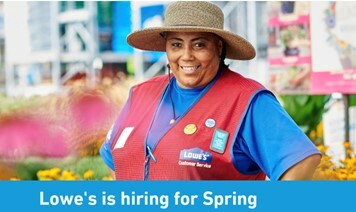 Search spring job opportunities for seasonal employment and view videos about spring hiring at Lowe’s. Grab a vest, and see why it’s more than just a job. Looking for something more? With the #LowesLife, you’ll find more than just a job – you’ll find a lifestyle. Take a look! I agree to allow representatives with Lowe’s Recruiting to send me text messages regarding my candidacy and send e-mail marketing messages related to job opportunities with Lowe’s. Message and data rates may apply. *Please note you will need to continue through the application process in order to apply.